Are all small crossovers created equal? The answer is of course not, even though they may seem nearly identical. Once you get to know the 2018 Ford EcoSport and Chevrolet Trax, choosing between them is a lot easier. For a closer look at these subcompact crossover SUVs, check out our comparison guide. As an all-new model, the EcoSport almost can't help but be the more comfortable crossover. 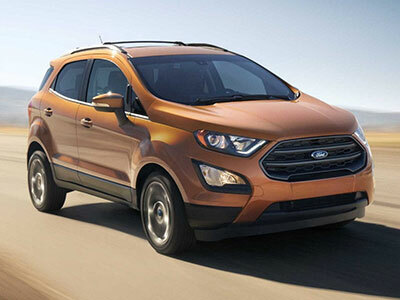 Its smooth, quiet ride cuts down on highway noise and makes the EcoSport road-trip-ready. And, whether you're headed to the local grocery store or across state lines, optional heated front seats and dual-zone climate controls set the tone for a comfortable ride. We like the 2018 Chevrolet Trax's comfortable seats. They supply the support you need on long treks. However, the ride quality could be smoother - and quieter, for that matter. Where the EcoSport suspension would soak up bumps, you'll feel some choppiness on uneven roads. This contest is almost too close to call. But, with its responsive infotainment and high-tech convenience systems, the EcoSport pulls ahead. We're big fans of Ford's Sync 3 infotainment system, which combines an easy-to-use touchscreen and sensible voice controls so you can stay connected with minimal effort. Sync 3 also includes Android Auto and Apple CarPlay capabilities, so you can interact with your smartphone's maps and messages app directly from your central touchscreen. The Chevrolet Trax, however, is also big on connectivity. Chevrolet's MyLink infotainment system comes standard on every model. This technology also includes Android Auto and Apple CarPlay capabilities, so you can stay connected with minimal distraction from traffic. If we have one complaint about MyLink, it's that the touchscreen could be a bit quicker to respond to your input. That may seem like a small complaint, but a few seconds can mean the difference between distraction and disaster. The Chevrolet Trax has the advantage here, thanks to its standard OnStar emergency telematics system. This technology helps you solve frustrating problems, thanks to features like on-demand roadside assistance and automatic collision notification. On higher trim models, you'll also find a bevy of advanced safety aids - like forward collision alert - to help you navigate busy roads. The 2018 Ford EcoSport offers optional blind-spot monitoring to help you detect vehicles that have crept outside your vision. Use this technology to switch lanes on the highway in the safest possible manner. However, if you're looking for other safety aids, such as lane departure or forward collision warning, you won't find them on the EcoSport. Save the most on gas with the peppy EcoSport. Equipped with the turbocharged, 1.0-liter three-cylinder engine, this subcompact crossover earns 27 city/29 highway mpg. No matter which powertrain you select, however, you can always add all-wheel drive to your EcoSport for an increasingly capable performance over wet or icy roads. With front-wheel drive, the 2018 Chevrolet Trax matches the EcoSport's EPA rating of 28 mpg combined, earning 25/33 mpg. However, the Trax powertrain isn't quite as speedy, with noticeable lag as you merge onto highways. The Trax also offers all-wheel drive, but the added weight of this heavy performance equipment is a further drag on acceleration. In the end, the 2018 Ford EcoSport has our vote. You don't have to take our word for it, though. Come to Brighton Ford and test-drive the all-new EcoSport for a firsthand look at its roomy, comfortable cabin and user-friendly technology. You'll also see what we mean when we talk about its smooth, quiet ride.